The Personnel Decontamination Kit (PDK) brings key members of First Line Technology’s DeconTect family together into a quick response kit that is readily available and easily deployed. 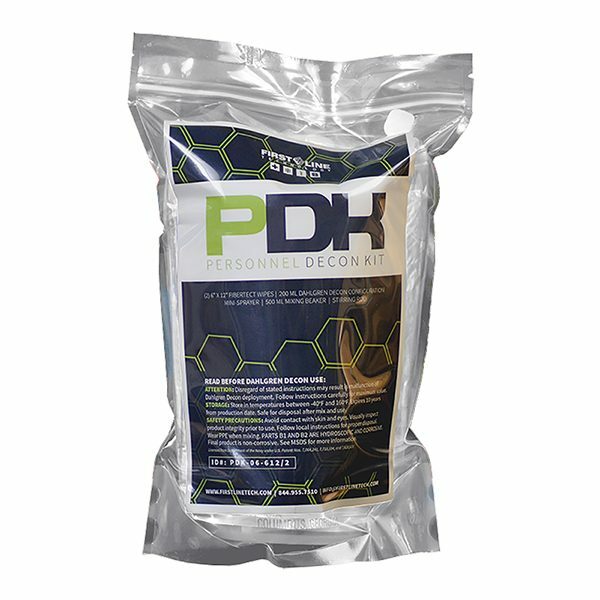 Each PDK includes (2) FiberTect wipes (a three-layer activated carbon composite wipe), DahlgrenDecon (a fast-acting, non-corrosive, three part solution) and a personal sized sprayer (200ml) allowing for effective decontamination of one individual. This set of products allows any user to execute effective bulk decontamination with FiberTect wipes, then neutralize and kill any remaining contaminants by using DahlgrenDecon for a variety of immediate, tactical, operational and cold weather decontamination needs.